Get #benup with #teamroast as we warm up for Pan Semis at Rise N' ROAST sunrise cooler party! 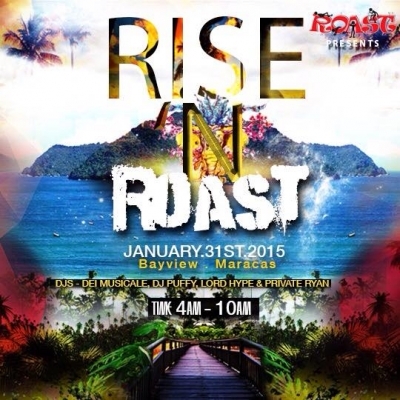 It all goes down on Saturday January 31st at Bayview Maracas, from 4am till 10am. Your DJs are DEI Musicale, Lord Hype, Private Ryan and reppin' Barbados, DJ Puffy! Limited advance tickets will be available at TT$250 and tickets go on sale Friday 9th January 2015 at http://www.ticketpal.com/events/699/RiseNRoastTrinidad2015/ Join our event pages to stay updated. Bajan Crew, link a ROAST committee member to join us at Pan Semis on Sunday February 1st!